In marked contrast to other regimes that have, virtually overnight, abandoned state control of enterprises and espoused Western models of corporate governance, China has pursued a gradual transition suited to its own unique traditions, culture, and customs. Although this new corporate system is still evolving, it is clear that China is now ready for a nation-wide movement of corporatisation and reform. 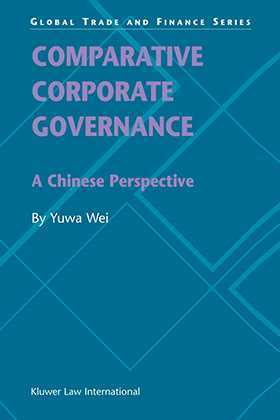 Comparative Corporate Governance draws on the entire corpus of corporate governance theory, both East and West, and also on the experience of many countries since the 1930s, to develop a coherent model appropriate for China. In the process the author shows how various corporate mechanisms have been tentatively introduced into China's state-owned enterprises and how such experimentation has, piece by piece, provided a firm basis for a modern enterprise system. How to build an efficient and culturally appropriate governance system, both in law and in practice, on this foundation is the focus of this book. The analysis is notable for its insistence that, for a corporate governance system to work, the principles and practicalities of that system must be derived from customary cultural norms. Experience shows that imported models, although they may be enshrined in law, lead to economic stagnation unless actual practice is monitored and reformed and the laws change to reflect these necessary adjustments. Thus the model proposed here begins with the Company Law of 1994, and proceeds to show how practical experience is already providing valuable data for the task of improving the law. This process, by which law and business practice continue to "regulate" each other, is, in the author's view, the essential ingredient of a successful corporate system. The author's approach is fundamentally comparative. He discusses and analyses models that have either created globally powerful corporate economies or carried out reforms that have brought new insights to corporate development. In this connection he examines the law and experience of the UK, the USA, Germany, and Japan, as well as Chinese communities overseas and some former British Commonwealth countries. This remarkable book is of inestimable value to practitioners and academics in the field of international economic law. In addition, its often startling perspectives on the accepted models of corporate governance are sure to spark a reassessment of the nature of corporations and their role in social and economic life. Details of Contents. Introduction. Part One: The Conceptual Aspects of Corporate Governance. 1. An Overview. 2. The Nature of the Corporation and Corporate Governance. 3. The Extension of the Corporate Concept: Corporate Groups. 4. The Extension of the Corporate Concept: Multinationals and Transnationals. 5. The Current Trend: Corporatisation and Privatisation of the Public Sector. Part Two: China's Experience with the Corporation and Corporate Governance. 6. Corporate Development before 1949. 7. Corporate Development from 1949 to 1978. 8. The Enterprise Reforms after 1978. 9. The Development of Corporate Governance in China: Law and Reality. Part Three: Some Important Models of Corporate Governance. 10. The UK Model. 11. The US Model. 12. The German Model. 13. The Japanese Model. 14. The Corporate Governance Model of Overseas Chinese Communities. 15. The Corporation and Corporate Governance in Selected Commonwealth Countries. Part Four: Designing a Chinese Model of Corporate Governance. 16. The Determinants which Shape the Development of a Corporate Governance System. 17. Creating a Competitive Market Environment for Corporate Development. 18. The Challenges in Seeking a Practicable Chinese Model of Corporate Governance. 19. The Future Development of Corporate Governance in China. Bibliography. Index.